Earlier this week several Guiders from Burnaby Mountain District attended the West Coast Area annual awards dinner. This is a great event with hundreds of Guiders from all around Burnaby, Vancouver, New Westminster, Richmond, Ladner, and Tsawwassen. It’s a great way to say THANK YOU to our wonderful volunteers, and some even get recognized with formal awards for their contributions. This year we had several members in our district get recognized for their many years of service. One of these women, pictured below, was recognized for 55 years of service. Another, who was unfortunately unable to attend the evening’s event is celebrating 60 years of membership! In addition, several women throughout the area were presented with merit awards for their outstanding service. One of these was one of our University Highlands Guiders, pictured below, who received a Bronze Merit Award for her dedication to Guiding. In addition to taking on increased responsibility when one of her co-Guiders went on leave earlier this year, this Guider is responsible for a patrol going to SOAR (a week-long camp in Smithers this summer), and is consistently involved in district events including organizing the Science Day at SFU last spring. Way to go! Over all the event was a lot of fun. The ladies at the Burnaby Mountain table had a great time socializing and enjoying each other’s company. They all enjoyed a great meal, and also enjoyed browsing the silent auction. We’re currently working on our plans for next year’s leadership and we need some more enthusiastic women to join our team! If you, or someone you know, would like to join the sisterhood of Guiding please reach out any time. We’d love to give you more information. Last night West Coast Area held its annual awards dinner to thank all Guiders in the Area for their hard work and to recognize extraordinary contributions with awards. Our district filled two whole tables with Guiders who enjoyed a wonderful meal and a silent auction benefiting girls going trips this summer. Our district was also proud to see seven of our adult members recognized with awards. Here is a list of who recieved what. The Membership Pin indicates years of membership in the organization. After 15 years of membership, pins are awarded every 5 years. 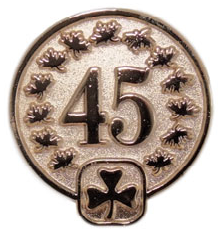 Awarded for 45 years of dedicated membership in Girl Guides of Canada. The Gold Thanks Pin may be awarded to girl or adult members for exceptional service to Guiding. They are given at the district or area level. The Commissioners and Administrative Communitiy Leaders Award is presented to Commissioners who lead by example, actively welcome new Members and retain current ones, mentor adult Members, and uphold the values of GGC. Awarded for stepping up to the plate as a new member commissioner when the district was desperate and going above and beyond the requirments of her role at Area council and benefiting the Distric immensely. The Broze Merit Award is given to a person who goes above and beyond the basic requirements of her role and demonstrates dedicated service to Guiding. Awarded for her dedication in helping her unit recover from several issues that threatened to close her unit. She worked tirelessly to repair administrative issues requiring close work with the District Comissioner and Treasurers all while offering a great program to her girls. Awarded for her ongoing dedication to her very large Guide unit, promoting Guiding in her daily life, and being a positive role model to her girls. She takes on the important role of communicator for her unit. Awarded for her longtime commitment to her girls and the district. She has gone above and beyond, often volunteering to do things like help with unit bookkeeping. The Silver Merit Award is given to a person who goes above and beyond the basic requirements of her role and demonstrates excellent service to Guiding. Awarded for her accomplishments in creating and maintaining the district website and Facebook page, as well as attending volunteer fairs, resulting in increased membership in her district and in others. Congratulations to all of the award winners. Your contributions to Guiding are greatly appreciated. Our girl programs would not be possible without the tireless work of these amazing volunteers.